Following are a few key references. For a comprehensive list of references please download the PDF. Orsulic-Jeras, S., Schneider, N. M., Camp, C. J., Nicholson, P., & Helbig, M. (2001). Montessori-based dementia activities in long-term care: Training and implementation. Activities, Adaptation, and Aging, 25, 107-120. Orsulic-Jeras, S., Judge, K. S., & Camp, C. J. (2000). Montessori-based activities for long-term care residents with advanced dementia: Effects on engagement and affect. *The Gerontologist*, 40, 107-111. Rose, M. S., Camp, C. J., Skrajner, M. J., & Gorzelle, G. J. (2003). 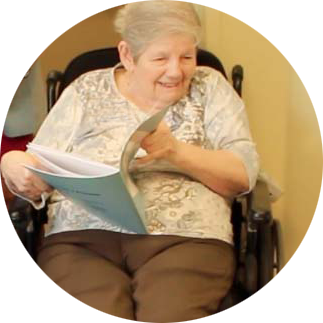 Enhancing the quality of nursing home visits with Montessori-based activities. Activities Directors’ Quarterly, 3, 4-10. Vance, D. & Johns, R. (2002). Montessori Improved Cognitive Domains in Adults with Alzheimer’s Disease. *Physical Occupational Therapy in Geriatrics*, 20(3/4), 19-36. Judge, K. S., Camp. C. J, & Orsulic-Jeras, S. (2000). Use of Montessori-based activities for clients with dementia in adult day care: Effects on engagement. American Journal of Alzheimer’s Disease, 15, 42-46. Dawson, P, Wells, D., Kline, K., (1993) *Enhancing the Abilities of Persons with Alzheimer’s and Related Dementias: A Nursing Perspective*: New York:Springer Publishing Co.
Brush, J.A. & Camp, C. J. (1999). Effective interventions for persons with dementia: Using spaced retrieval and Montessori techniques.